= The camera is too close, you know. Hi everyone! I am Max! I am Maggie’s best friend and I will be your guest teacher today for the first time in a long time. I know I am cute, but the camera is a bit too close. Don’t you think? Maggie told me that you studied the suffix よ ( = yo) and ね ( = ne). 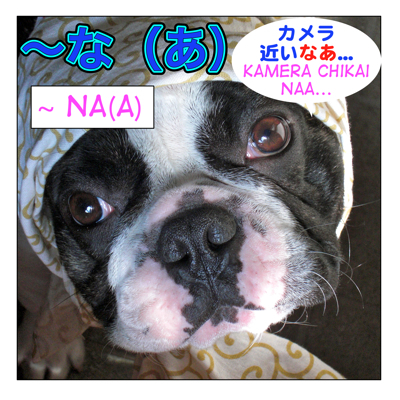 Today we will learn another casual suffix, な ( = na). Since it is for casual speech, you should only use it with family or friends, OK? Some of the usage of な ( = na) is for a male speech. So I will mark neutral (both women and men use) or male speech. 1) When you express your opinion or feeling. (Both women and men use). You use the suffix ね ( = ne) when you ask for agreement from a listener. = This is delicious, isn’t it? You use the suffix なあ ( = naa) when you express what you feel or think. Sometimes you are just talking to yourself so it doesn’t matter whether you have a listener or not. = Samuku natte kita naa. = Ah…It is getting colder. = Kono baggu, hoshii naa. = I’d love to have this bag. / I really want this bag. = Maggie sensei wa, kibishii naa. = Maggie Sensei is strict. = Komatta naa. Teikiken wo ie ni wasurete kita mitai. = I am in trouble. (I don’t know what to do.) I think I left my commuter pass at home. = Henda naa. Dare mo ie ni inai. = How strange… Nobody is home. Sometimes you say that to someone to show your emotion. = Kore, sanman en mo suru no? Takai naa. = This costs 30,000 yen?? How expensive! = Robaato wa sugoi naa. Mou sonna muzukashii kanji ga yomeru no? = You are great, Robert. You can read that difficult kanji already? = Maggie ga oishii tte itte ita jaakii kore ka naa? = I wonder if this dog treat (literally: jerky) is the one Maggie said was delicious. = Eki wa doko kana./ doko kanaa. = I wonder where the station is. = Ashita wa hareru kana./ hareru kanaa. = I wonder if it will nice (weather) tomorrow. = Chotto shiokarai kana./ shiokarai kanaa. = I wonder if it is a bit salty. = Sore wa hontou kana./ hontou ka naa. = I wonder if it is true. = Kare wa majime dakara zettai ni uwaki wo shinai ne. = He is serious, so I bet he won’t cheat on you. = Sore wa dou kana/ dou kanaa. = Hmm I don’t know about that. な ( = na) suffix is generally considered to be “male speech”. Male speech is rough so you have to be careful who you use with. The speaker is talking to oneself. In this case, both men and women use. However, if you use な ( = na) suffix when you are talking to someone asking for their agreement or confirmation (just like ~ ね ( = ne) suffix), it is for male speech. You sometimes add よ ( = yo) before な ( = na) when you ask agreement from the listener. * Asking for agreement from the listener. This usage is the same as ね ( = ne) which is more feminine or neutral. = Mukashi wa yoku sono geimu wo issho ni yatta na. / yatta yona. = We used to play that game, huh? = Tanaka mo yaruna. / yaru yona. = Tanaka is something, huh? = Anoko, kawaii na. / kawaii yona. = Don’t you think she is cute?/ She is cute, isn’t she? = Sore wa hidoi na. / hidoi yona. = That’s horrible, isn’t it? Note: ~よな ( = yona) is almost always for male speech. = Koukou no toki, megane kakete ita Tanakatte oboeteru? = Do you remember the Tanaka guy, the guy who wore glasses? = Aa, souiu yatsu, ita na/ ita yona. = Ah, there was that kind of guy. = Saikin, shigoto ga fueta na. / fueta yona. = We have more work now, don’t we? = Toukyou ni ikuno, ashita da na/ ashita da yona. = We are going to Tokyo tomorrow, right? *When you tell someone what you are going to do. = Ie ni kaettara meiru suru na. = I will text you when I get home, OK? = What happened to the matter? = Aa, kuruma no ken na. Daijoubu. Tehai shite oita kara. = Ah, about the car. Don’t worry. I have arranged it already. = I am off, OK? *When you give your opinion to someone. = Kyou wa, yoku benkyou shita na. = Sono doresu, niau na. = (I think) You look good in that dress. = Kanojo wa nani wo kite mo niau naa. = She looks good in any outfit. = Kyou wa, yoku benkyou shita naa. = I think I studied hard today. するな ( = suruna) Don’t do something. = Don’t do such a thing. = Kono koto wa dareni mo iu na. = Don’t tell anybody about this. = Mou kare to wa auna to iwarete mo au kara ne. = Even if you tell me not to see him anymore, I will see him anyway, OK. It is a rough male speech but you may also see it in a warning sign. = Koko ni hairu na. When you are talking to someone asking for an agreement. = Kaisha no soto de au nante mezurashii desune. = It is unusual to see each other outside of the company, isn’t it? = Kaisha no soto de au nante mezurashii desuna. Though it uses な ( = na), it is polite. However, we tend to hear this from older men. 元気だった？= Genki datta? = How have you been? = Appu no kao mo iketeru yo. = Your close-up face is cool, you know. Thank you very much. taihen benkyuu narimashita. Every time i search nihongo topics, I always check if you have that lesson first before i open other websites … :-).. Thanks for this, I always wondered about the nuance between ‘ne’ and ‘na’. The examples were quite helpful in grasping this difference! I am happy to hear you got the idea of な（あ）. You said な can be used to tell someone you’re going to do something, but also can be used to tell someone not to do something. also mean “When I get home, don’t text (me),” if the context allows for it? Q：When I get home, don’t text (me),” if the context allows for it? When I get home, don’t text (me),”→ I would say “俺（僕）が家にいる時はメールするな。”/ 家にはメールするな。 Don’t text me when I am home. and the intonation is different. It is too bad that I can’t attach a sound file here but 1) you stress “食べる” more. and you say 2) more softly. Aa, souiu yatsu, ita na/ [iata] —> ita yona. I am sorry but I don’t have a Youtube channel and don’t make video. Sensei i have a request can u make a lesson about onomatopoeia japanese? You know what? Tofugu has a great lesson on onomatopoeia. Thanks! Both this and the previous lesson are very useful! Thank YOU for your comment. I am happy to know you found these lessons useful.